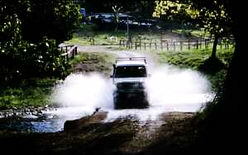 Adventure tours, cruises and 4WD tours in the Byron Bay, Tweed Valley, Gold Coast hinterland region of New South Wales and Queensland, Australia. 4 wheel drive and adventure tours (including walking and cycling tours) generally have smaller groups (2-16 people) and go to out-of-the-way places or "local knowledge" spots not visited as often as the usual tourist spots. You'll have the chance to view our native animals and birds in their natural environment, and feel the wind in your hair, the sun on your face, or catch the rain on your tongue as it falls during a shower. Find out about the World Heritage of the region, and when you visit our natural and scenic attractions please observe the Guidelines for Ecotourists. Cruisin' without Bruisin' - Code of Practice for Recreational Vehicle Users This code of practice for recreational vehicle users in Tasmania could be applied anywhere active recreational activities are allowed. North Stradbroke Island is one of the largest subtropical sand islands in Australia, with an incredible array of marine life, flora and fauna including eucalyptus and banksia trees, kangaroos, koalas, dugons and more. Soak up all the beachfront beauty and surf-centric charm of Byron Bay on this day tour. Soar over the sea in a gyrocopter, kick back at a barbecue lunch on the beach and trek out to the Cape Byron lighthouse with a friendly local guide leading the way.